Located 386 km south of Sydney via the Princes Highway Cobargo, like Central Tilba which is only 19km away, has developed into an attractive village with a ‘heritage’ feel. 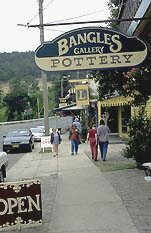 It is another small village of old-fashioned stores, art galleries, leather and wooden craftwork, potteries, an iron forge, tea rooms and antique shops. It even has a wheelwright. The town probably got its name from the local Aboriginal word ‘cubago’ which some sources claim was used to describe Mount Dromedary. This seems doubtful as the local Aboriginal community now insist that Dromedary is correctly named ‘Gulaga’ – about as far from ‘cubago’ as you could get. The area was settled in the late 1820s when a number of graziers moved stock into the district. By the 1830s the Imlay brothers had substantial holdings. It wasn’t until the improvement of the coast road in the 1880s, and the construction of a bridge over the Narira Creek in 1882, that the town really came into existence. In the 1890s the town, and surrounding district, was large enough to sustain a local newspaper – the Cobargo Watch. 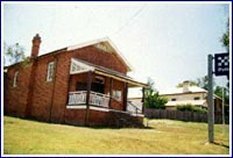 It was around this time that the Bank of New South Wales was built on the corner of Bermagui Road. For most of the twentieth century the town has been in decline as transportation has made the larger centres more accessible. In the past decade it has been revitalised, in much the same way as Mogo and Central Tilba, by the arrival of gift shops and cafes which entice the traveller to stop and have a wander up and down the main street. Cobargo is also a logical point of departure for an investigation of Wadbilliga National Park with its rugged mountain ranges, wide plateaus, deep river valleys, wet sclerophyll forest, heathland, bogs and pockets of rainforest. This untouched wilderness area is home to 122 species of native birds as well as swamp wallabies, echidnae, possums, platypus, eastern grey kangaroos and wombats. The most spectacular features of the park are probably Tuross Falls (35 metres) and the 5-km Tuross River Gorge. Both are on the western side of the park. The falls can be viewed from a 3-km walking track which departs from the Cascades camping area. From Cobargo follow Bourkes Road through Yowrie and on to Lake Creek Camping Area by the Wadbilliga River. Several kilometres further beyond this point is the highly scenic Wadbilliga Crossing Picnic Area. All three locations have toilets and picnic-barbeque facilities. The park’s pristine state means that exploration is mostly by foot, and then for experienced bushwalkers and naturalists who enjoy lengthy walks and are prepared for an overnight stay. Note that heavy rains can render roads and river crossings problematic if not impassable, so it is best to enquire about local conditions before setting off. The Cobargo Police Station comprises of one general duties police officer. They cover a sector extending from Dignams Creek (north) to Brogo Bridge (south) on the Princes Highway and from partway to Bermagui on the Bermagui Road (east) to Conways Gap, located on the escarpment (west) behind Nimmitable. Although the officer is on 24-hour a day emergency call out, there are other police in the area who assist with policing the sector. With the vast area that has to be policed there are often times when incidents which require attention have to be prioritized sometimes causing delays in police attendance. In recent times there has been a fundamental shift in concept of service delivery and command chain within this area. Previously, police stationed at Cobargo have been accountable to an inspector at Bega who commanded a patrol from Eden to Cobargo. Another patrol commander was responsible from Dignams Creek Bridge north of Cobargo to Batemans Bay. There are duty officers (inspectors) located at both Batemans Bay and Bega who are responsible for the day-to-day of the command. Police within this area command are broken into teams with a sergeant leading each team. For geographical and associated reasons, Cobargo is now part of the Narooma team. To most residents there seems little change in service delivery. However, to those dealing with police on a regular basis or in relation to a substantial complaint, there are now a core of police from Narooma and Bermagui to attend to policing matters in the Cobargo/Quaama area when required. If necessary there can be specialist police called in from as far away as Queanbeyan, Sydney, Bega and Batemans Bay.